Rust-brown copper with a wonderfully silky red shimmer shines in the glass, from the oily streaks sticking to the glass wall, a multitude of small drops are released, these dragging their endless paths back into the glass in slow motion. Creamy roasted aromas stand out heavily from the premium snifter and mingle with sweet raisins and hazelnuts. Malted cereal notes flash before dark and dried berries distribute their lush and smooth fruit aroma, velvety vineyard peach and creamy apricots fall in milk chocolate, sour cherries come on. From creamy caramel and sweet toffee dissolves a minimal smoky notes, currants and blackberries show off their sour side. Spicy wood tones mix with fruit salad and milk chocolate, the alcohol is mild and harmoniously integrated. Sour cherries and spicy wood elements dominate the first impression. Chocolate and caramel come on, dried grapes and berries combine with hints of hazelnut and malty cereal. The mouthfeel gets noticeably creamier, a few butter flakes swim in the saliva under the tongue. Slowly sets minimal sharpness and tickles on the tongue. In the second sip, redcurrants and blackberries are followed by the sour cherry note, discreetly in the background, while apricots and oranges are doused with caramel and chocolate. Raisins and date end in subtle sharpness, a tiny pinch of white pepper spreads on the tongue and spreads its mild spiciness. Hazelnuts and chocolate, raisins, apricots and oranges, cherries and redcurrants are increasingly showing, with a minimal smoky note, malt and caramel. The dark and dried fruit flavors stick with a tangy whale and hazelnut aroma on the palate. In the aftermath, the creamy and buttery mouthfeel is particularly intense, cedar wood and a hint of menthol or fresh mint end in subtle smoky and tobacco notes. Slowly the reverberation fades out and after a few moments gains in volume and complexity again. Pleasant warmth runs through the palate, spicy wood tones and a minimum of breathy wet leaves end in slightly peeled walnuts. What remains is minimal smoke and cedar wood. Tart and yet creamy, the finish finally ends. This is again a really great bottling of the personalities series. The edition No. 22 was not bad in my opinion, it was also quite good, but different than expected. The sherry influences had left only minimal traces but for that one got offered a lot of exotic fruits. The Edition No. 23, however, is just as I expect it from a nearly 30-year sherry keg stored whisky. 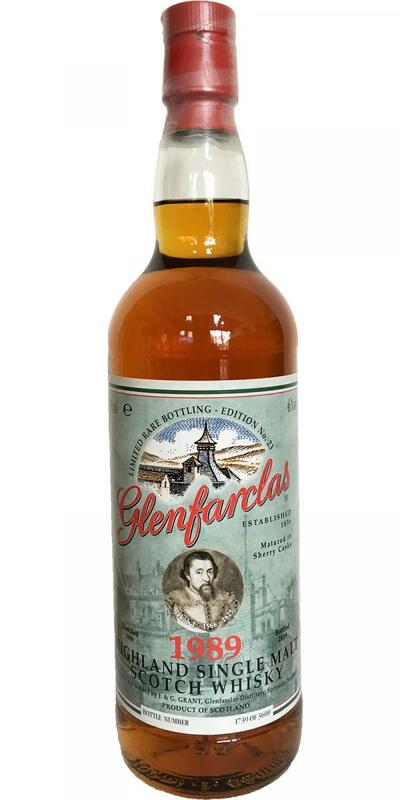 An old and well-seasoned Glenfarclas who does not even try to hide his origins. 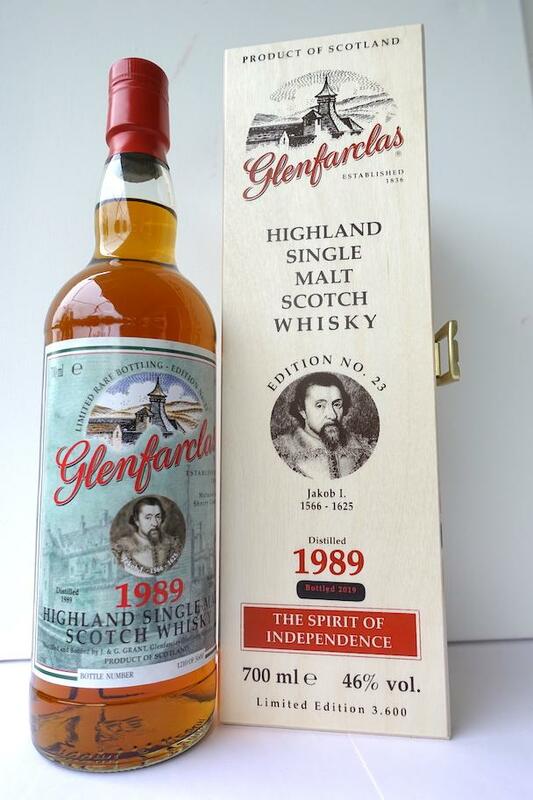 The 1989 vintage of Glenfarclas really seems to have been extremely good. I already had some of them and they were first class without exception. Of course, the 1989 Family Casks are particularly noteworthy here. But that's exactly my problem with this bottling. In terms of price, she is quite at the level of a 1998 W17 Family Cask, which I find a little better then. 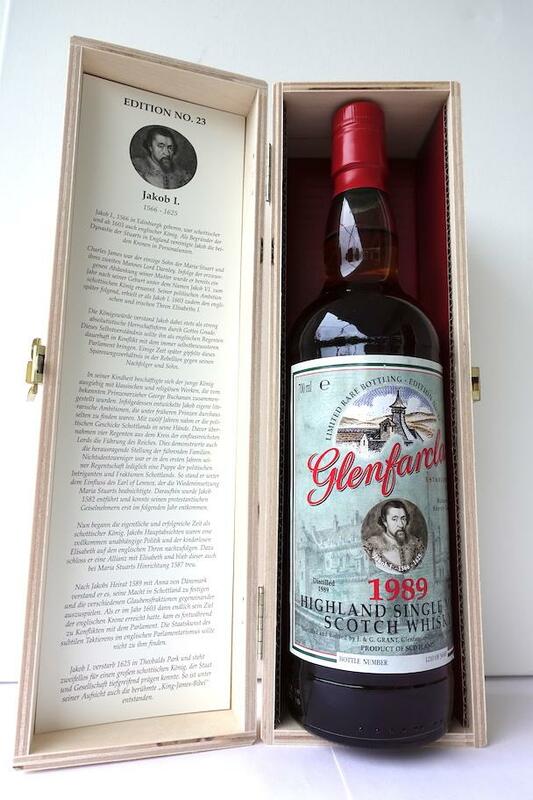 Compared to the 1989 Family Cask (W17 + S18), this edition is of course a bit cheaper, but it can not really keep up with these even though it's already in this direction. On the other hand, the invoked price is of course compared to other "brands" for a nearly 30-year-old of this quality level again as favorable to call. So I am quite a bit torn. A really great malt which I rate today (April 2019) with 91/100 points. But in case of doubt I prefer to go to a family cask in this price region. These offer at a similar price but then a little more of everything, even the younger such. Eg the 1998 W17. Yes that is fun! Not a dark, crumbly sherry board, but a dignified senior with the herbal note typical of her age and neat complexity in the nose, mouth and finish. In the nose first a jar of dark black cherries - after the first sip suddenly an extremely dominant marzipan note, which is slowly replaced by fruit cake, chocolate and cinnamon. Great mouthfeel, the alcohol is super integrated. In the long finish quite a bit wooden bitterness and dark chocolate. In the reverberation comes the cherry jam again. The whisky is not superimposed, on the contrary: all aromas are complex, complex, but at the same time balanced, harmonious and well integrated. Yes, what a pleasure! And at about 180 € quite a good price / performance ratio for a nearly 30-year-old senior.